Dax Shepard and Lake Bell star in ABC's Bless This Mess. 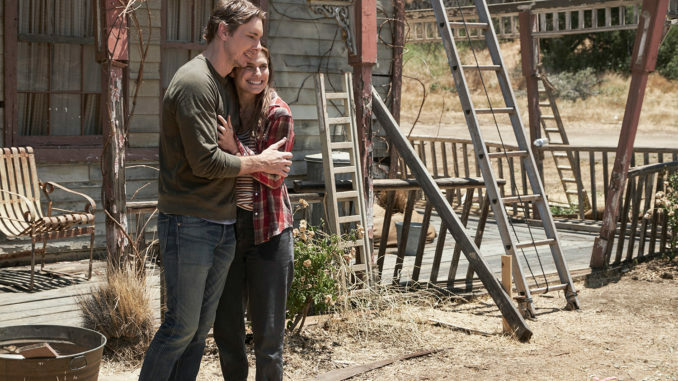 In ABC’s quirky comedy Bless This Mess, millennials Mike (Dax Shepard) and Rio (Lake Bell) flee the stress of New York City for life in rural Nebraska, lured by their pioneer spirit and a farmhouse left to Mike by his great-aunt Maggie. They are fueled by the daydream of an uncomplicated life growing alfalfa and head to the heartland armed with big-eyed ambitions, YouTube tutorials and the most useful of Midwestern farming implements: a surfboard. Upon arrival at their homestead, Rio and Mike discover that the simple life won’t be as easy as they’d imagined: The ground is barren, and the Pinterest-worthy farmhouse they’d envisioned is actually a dilapidated shack — complete with squatters of both the four-legged and humankind. But the newlyweds won’t be deterred. “I don’t want you to underestimate the power of some sandpaper and some elbow grease,” Mike assures Rio. What Mike and Rio lack in farming know-how, they make up for with pluck and a blithe underestimation of the hard work ahead. And while Shepard and Bell share charm and chemistry that are undeniable, the supporting cast of colorful characters who inhabit the small town is where the series has the potential to really shine. Bless This Mess is co-created by Elizabeth Meriwether (New Girl, Single Parents) and also features slapstick-filled performances from David Koechner (Superior Donuts, The Office) and Lennon Parham (Playing House). Despite Mike and Rio beginning as a couple of fish out of water, they may eventually learn that they’re swimming in the right direction.